Just when her career was starting to take off, Rosina Lin (林夏薇) decided to take an indefinite leave from the entertainment industry to focus on married life. The 31-year-old ex-TVB actress got married in a low-profile wedding to wealthy businessman, 47-year-old Jason Mok (莫贊生), in 2015. After leaving TVB, Rosina placed more time into developing her hotpot restaurant business, which has expanded to ten locations now. Although Jason was previously exposed to have a net worth of $2 billion HKD, the couple seem to be faced with some financial hardships recently when flyers were posted outside of their home. Following the incident, Rosina published three cryptic posts on social media, perhaps in response to the occurrence. From the ambiguous messages, it appears that Rosina and her husband will not further address the issue and will instead let the matter slowly unfurl itself. 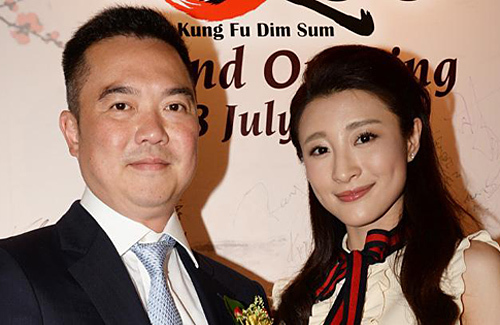 3 comments to Rosina Lin and Husband, Jason Mok, Are Having Financial Issues? @peachyogurt People with poor credit can’t get any loans from bank because the bank needs to protect themselves. So they are forced to turn to loan sharks. @mike Are loan sharks still legal in HK? Thought it’s all been cracked down my law enforcement?